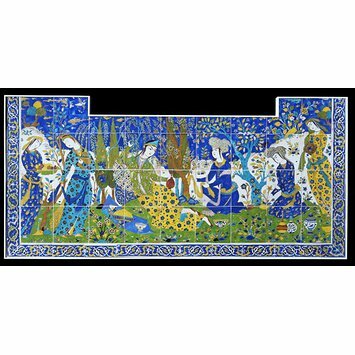 This tile panel covered the lower part of a wall, probably in a palace in Isfahan. It is shaped to fit under a window or niche. Springtime scenes of outdoor meals or entertainments were popular in Safavid art and poetry. Here a young woman is the centre of attention, surrounded by her attendants. The blue-and-white vessels on the ground may be Chinese, or Iranian copies. The Safavid dynasty was established in 1501 by Shah Isma’il. He was the young but charismatic leader of the dervish brotherhood founded by his ancestor, Shaykh Safi al-Din. Isma’il reunited Iran and made a branch of Islam known as Shi’ism the religion of the state. Many of Shah Isma’il’s successors, including his son Tahmasp, were great patrons of the arts. They developed a dynastic style in which human figures played an important role. This was in strong contrast to their main rivals, the Sunni Ottomans, who generally avoided such motifs. Tile panel depicting a lady being served with wine and fruit by her attendants in springtime in an outdoor setting. The panel of square format, is of a coarse composite fritware, coverd in a white tin oxide slip and painted inglaze pigments, including cobalt blue, yellow and turquoise, outlined in black in the cuerda seca technique. The border panels have a design of foliate and cloud scrollwork (139.3-1891) or intwined lotus scrollwork (139.4-1891). Bought from L.S. Myers, 6 Savile Row, for £275. H 3'7". VAM Ceramic Department Registers 'Panel. 36 tiles plus border. Lady in rich garments and diadem reclines in a garden with attendants. Part of dado in Chehel Sotun. Persian, late 16th - early 17th century'. Large-scale tile panels with figural decoration are not uncommon in seventeenth-century Iran, providing a dramatic contrast to the resolutely non-figural tilework made in contemporary Ottoman Turkey. This panel is thought to have come from the Chihil Sutun or "Forty Pillars" palace in Isfahan. It depicts a group of people gathered for a picnic in a garden. At the center, an aristocratic couple sit in flirtatious conversation, while around them others (possibly their attendants) bring bottles of wine and trays of sweetmeats. The blue-and-white vessels on the ground may be Chinese, or Iranian copies. 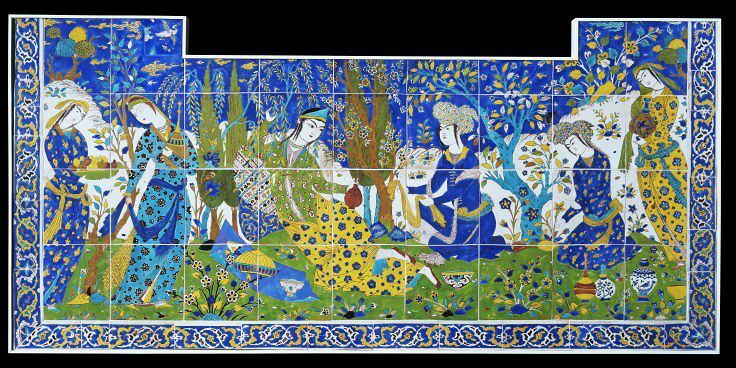 Tile, one of four, forming a panel with picnic scene, Iran (probably Isfahan), 1600-1700. Pascal Coste, Monuments Modernes de la Perse, Paris, 1867, p.31 pl. XLI, XLII, XLIII. Voyage en Perse de MM. Eugène Flandin, peintre, et Pascal Coste, architecte, Paris, 1851-4, pl. LI. S.G.W. Benjamin, Persia and the Persians (London: John Murray, 1887): reproduced on p.301, 'Old Mural Painting of Tiles from Palace of Shah Abbass'. Springtime scenes of outdoor meals or entertainments were popular in Safavid art and poetry. Here a young woman is the centre of attention, surrounded by her attendants. The blue-and-white vessels on the ground may be Chinese, or Iranian copies. 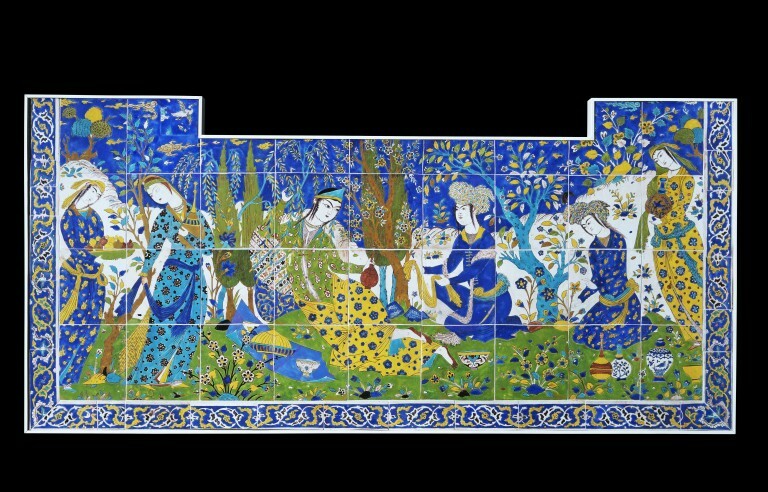 This tile panel covered the lower part of a wall, probably in a palace in Isfahan. It is shaped to fit under a window or niche. Said to have come from the Chihil Sutun ('Forty Columns') palace in Isfahan.